This sprawling, impressive royal complex was the first palace of the founders of the Qinq Dynasty. 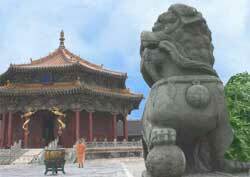 Ground was broken for the palace complex in 1625 under the auspices of the Qing Dynasty's first founder. It took ten years to complete. The palace's day in the sun was brief. The Qing Dynasty moved its royal seat from the Shenyang Imperial Palace to the Forbidden City in Beijing after their armies defeated the Ming Dynasty in Beijing in 1644 and later conquered large areas of China. Many of the buildings are well preserved. However, some have deteriorated or lost their former royal character due to weathering, commercial encroachment, or official indifference. The good news is today's government plans to restore and refurbish some buildings, interiors, and street ambiances. Moreover, I have heard that the palace complex executives plan to showcase key relics using modern lighting, multi-language audio guides, and educational touch-screen video monitors for the benefit of visitors. It is the leading attraction of the palace. It houses the throne.